If you take a peek inside the Bethel Centre you will find an unexpected diversity of good food finds – Flying Pizza, an Indian restaurant, Morone’s, Nanak Bakery, several other spots and a terrific Turkish Restaurant – Cafe Shish Kebab. The exterior looks drab and generic. Inside, it is obvious the ownership spent a lot of time, energy and thought to create an authentic and comfortable dining environment. The interior is delightfully Turkish – paneled wooden walls, artwork and plenty of small touches to transport you to Istanbul or Constantinople…. 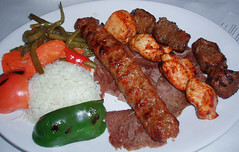 The best way to sample the cuisine is to share the appetizer sampler with a friend or two while splitting the mixed grill kebab (shish kebab, chicken kebab, adana/ground beef kebab, and doner/lamb kebab). Finish things off with the Keskul (almond pudding) topped with chopped almonds and pistachios. A great lunch or dinner. 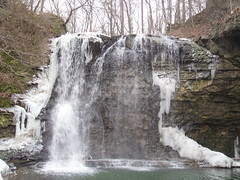 If you feel bit bloated, less than three miles down the road is Hayden Falls (SR 33 and Bethel Road) A short and scenic hike leads to a waterfall hidden away in the burbs. 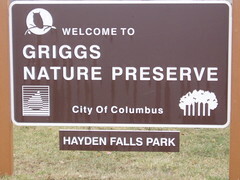 The park has finally added a sign, stairs and a walkway to make this mini natural nook more accessible to non-rappelers. This entry was posted on February 8, 2008 at 6:12 PM	and is filed under restaurants, Vegetarian Friendly. You can follow any responses to this entry through the RSS 2.0 feed. You can leave a response, or trackback from your own site.